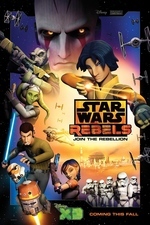 Ezra begins his Jedi training under the critical eye of Kanan with less than stellar results, when an illegal broadcast by a rebellious member of the Imperial Senate cues everyone to the presence of a captured Jedi Master being held in a remote and nigh impenetrable Imperial prison. The crew of the Ghost immediately formulate a rescue plan which ends with a terrifying discovery. Trivia from the Star Wars Rebels Trivia page for the episode! The Spire prison was originally created for a Darth Maul comic, "Son of Dathomir" and the environment was created for use in The Clone Wars. The Jedi Master featured in this episode was last seen in Revenge of the Sith on a beach surrounded by wookies on Kashyyk. While her death wasn't depicted, an animatic from the extras for the movie showed her being gunned down by a circle of clone troopers. The amorous flying creatures were known as tibidees as during production their names were "TBD" to be decided. The inquisitor states that Kanan's Jedi Master was Depa Billaba, who was a member of the Jedi Council (seen in episodes I and II) and will be featured with Kanan in an upcoming book about Kanan's background. The voice of Gall Trayvis is none other than Brent Spiner. Rise of the Old Masters is available for those with subscriptions to onDemand services and on WatchDisneyXD. I love The Inquisitor as a bad guy. I definitely enjoyed it and it did an interesting job of ramming home how something as ubiquitous as the Force in the time of the Clone Wars, just in the matter of a generation, has fallen so far out of the public consciousness. When Zeb makes the throw away statement, "No wonder no one follows the old religion anymore" (or something to that affect) it's indicating that so many Jedi have died or gone into hiding the Force is no longer considered present, but the past. Ezra balancing on the cannon turret was a straight up callback (call forward?) to Luke's balancing act in Empire when he's training with Yoda. Then, naturally, we get the direct Yoda quote, followed by the student giving up at their task, Ezra on hitting the containers being thrown at him and Luke attempting to lift the X-wing out of the swamp, and then the teacher demonstrating the power of the Force, Kanan catching and pulling Ezra back up to the Ghost and Yoda lifting the X-wing out of the water. The nice tweak, however, is Kanan's own admittance that he didn't quite understand what Yoda meant. Much of Kanan's teaching style reflected the sad state that the Jedi Order had fallen into by this point, he is not a Jedi Master, and the best he can do is imitate the Jedi Masters he knew. It's the slow decay in the power of the Jedi from the prequel trilogy where they seemed superhuman or near about to the simpler warriors of the original trilogy. Here's a piece of brain food, but after Yoda dies in Return of the Jedi, the only two individuals who have true Jedi training, are Darth Vader and the Emperor (and the Emperor basically gets an asterisk as he was trained as a Sith). Once they died, the institutional knowledge of the Jedi Order (barring surviving records) was all but destroyed to the limited technique and skills taught to Luke before he went rushing off to Bespin to save his friends. One question I had was whether Trayvis is a real rebel Senator or if his persona has been developed by the Empire to find discontents. Or was his persona simply stolen for the the creation of the trap? One of the darker aspects to Rebels, one that will be continual I hope, will be the empty space left by the Jedi, and how few still exist. I'm enjoying that aspect. It was definitely creepy how the Inquisitor was using the remains of the former Jedi Master. I wasn't overly thrilled with the Inquisitor, but I did generally like him. I hadn't realized in the info released up to the show that he was a Sith, so it was surprising. It also blows out the whole "There are always two...." theory of the Sith, which was kind of nonsense in the first place, unless it just means you won't find a party with 9 sith rockin' it out, but they keep to themselves in pairs. In the added scene to Spark of the Rebellion, Vader even tells the Inquisitor to try and recruit any young Force sensitive people he finds to the Dark Side. Which is exactly what the Inquisitor attempted to do with Ezra, albeit poorly. Does this also mean that there are other Sith or young people trained in the Dark Side? Kanan can be extremely awesome when he combines his Force powers with his general fighting ability. I don't think we've ever seen a Force powered clothes line before. One thing that stood out in this episode, more than any before it, was the style of the lightsaber animation. This is another one of those things they decided to link back to the original trilogy versus what developed in the Prequel Trilogy and in Clone Wars. They wanted the lightsabers to be thinner and more rod shaped (it was the use of reflective rods on the props that lead to this appearance in the first place). It was different, but I kind of liked it. During the duel with the Inquisitor, I had the feeling that Kanan was mismatched against him. His lightsaber skills were either rusty or just simply not developed enough, which is something we generally have not been used to with our lightsaber wielding Jedi in almost everything Star Wars. I had the strong feeling that the Inquisitor would have killed him but for Ezra's intervention. Another throwback to the original script for Star Wars? Laser Sword! Heh. Thanks for that, Atreides. You wrote what I've been thinking, but I've been too distracted to get it down. Admittedly I've avoided the EU like the plague, but I got the impression that Sith were a certain rank or level of training. I also recall something about the Emperor keeping a number of partially Force-trained densities to act as potential apprentices and canon fodder. And if the Inquisitor is only half-trained, that doesn't say good things about our heroes. I think that just being force-sensitive or a force user does not make one Jedi, in much the same way that being a force user and evil doesn't make a sith. A jedi is a type of monk who happens to use the force, so presumably a sith too is a particular sect of force user. The sith might still recruit force users but not indoctrinate them into the deeper sith mysteries (hereafter referred to as the Sythteries)..
"Besides Sith and Jedi traditions and Imperial dark side cadres, there were other organizations devoted to the Force. These often originated in another earlier tradition, but had left it after a schism or similar event. These could belong to either the light or dark side, or simply exist somewhere in between. Some of the better known examples of independent Force-user groups included the Ysanna, the Witches of Dathomir, the Aing-Tii Monks, the Baran Do, the Fallanassi, the Jensaarai, the Krath, the Sorcerers of Tund as well as many other Force-based organizations. Also, some Force-users did not adhere to any code or creed, but were self-taught or raised and trained by independent masters. There was also a family of Force-wielders known as "The Ones" on the planet Mortis." It also says that the inquisitor is not a sith. "this is a whole new batch of people and it’s almost ludicrous to think the Skywalkers are the only ones having adventures, getting into trouble, and saving the world in a galaxy far, far, away. There are people being born who are in tune with the Force, as there always have been, and it’s the job of the Inquisitor to take these people out." ,which I greatly approve of. Oh, and as I mentioned obliquely in last weeks thread, I think the idea is to show that these rebels have more or less got the measure of run of the mill imperials. They can, do some degree, handle a stormtrooper or two, that's not gonna be a problem, but they can't handle the inquisitor. They barely survive, and only because they run. I read somewhere that they explicitly didn't want an 80's cartoon villain. Like, if this guy shows up then you have got problems. He's not gonna show up every week with a convoluted plan and then lose for no good reason. He's gonna show up every so often, cause a lot of trouble and the good guys will maybe get away, but at a cost. And bear in mind that he still has a boss, who's scarier, and a boss's boss who's scarier again. It suggests that dealing with the inquisitor is hard enough, Vader or the Emperor is just out of their league entirely. Well, okay then me, if you insist. Pablo Hidalgo: "This isn't like cartoons I grew up with in the '80s where you'd have the villain lose every week and yet every week we'd have to believe he's some sort of threat"
Your strict adherence to citing yourself is saluted! A fair amount of my Force conceptions come from old school, pre-most of the EU, so it always helps to have reminders that it isn't nearly as black and white as it used to be (seriously, there were some major heated debates on the old internets over whether use of the Dark Side automatically made you evil/Sith or not....yowzah!) As an aside, I generally hated the Dathomir witches, who's use of the Force was generally portrayed as almost your garden variety magic use (spells/potions/curses...etc). On reflection to Clone Wars, in that midst between Attack of the Clones and Revenge of the Sith, you did have Palpatine, Dooku, Maul (Yes, still "kicking"), and Ventress, all running around at basically the same time. So the dual pairing was already leaking away by that point. I really, really like that aspect of a villain. Re the whole "there are only two" business, just as there are force sensitives who are not part of the Jedi Order, it stands to reason there would be dark side people who are not part of the Sith cult. Here's my - very possibly flawed - understanding of how things work from the Old Republic games and other bits of EU. Thousands of years ago, before Jedi or Sith, there were people who discovered the force, and they basically split along light and dark lines. Lots of wars and stuff which the light siders eventually win and the dark siders slink off into unknown space to lick their wounds. The light siders gradually develop into the Jedi Order. Off in unknown space, the fleeing dark side types find a species called the Sith. They kind of take them over and then gradually disappear into them through interbreeding, sort of like the Roanoke colony. So you have a race of Sith who are very dark side oriented, and they launch an Empire that eventually spends a lot of time at war with the Republic and the Jedi, and looks an awful lot like the Empire we know and love (this is Bioware's Old Republic game continuity which is about 3000 years before Star Wars proper). Eventually the Republic smashes the Empire, and they disappear again. That's when the Sith cult of dark side force users adopts the whole "there are only two" thing to go underground and play the long game, preserving their philosophy and teachings while they await their chance for revenge. That will eventually come when Palpatine gets the Empire's revenge by pretty much turning the Republic itself into a reborn Empire from the inside out. So you've got the official Sith cult in aestivation, passing the Dark Lord of the Sith title down from master to apprentice in secret. But there's still a bunch of "ethnic Sith" and other dark side sensitives running around being evil and Sith-y. I'm sure many of them don't know or care about the official lineage of Dark Lords, or are trying to recreate it themselves, and what have you.